Mega-resource Giving Servant Leaders Proven Strategies And Inspirations Of How To Motivate Their Members To Be Actively Involved In The Homeschool Group And Their Volunteers To Happily Keep Coming Back To Help The Group. Survive The Crisis. The Rule Of 20 Gives You The Plan You Need To Survive In A Crisis Or Disaster. The Oregonian, powering OregonLive.com, has launched the Best of the Northwest: Visitor guide to Portland and the Pacific Northwest iPad app, with premier issues focused on Greater Portland eating and drinking, events, music and the outdoors. 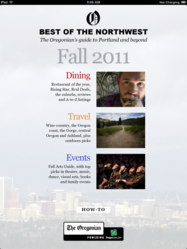 The Best of the Northwest: Visitor guide to Portland and the Pacific Northwest iPad app can be downloaded now for free. It also includes an introduction to the region, with photos, videos and short essays about what makes the Pacific Northwest a world-class travel destination. Future issues will include timely updates on venues and events in Greater Portland, plus coverage of other areas across the region, including Seattle and Vancouver, from the newsroom of The Oregonian. ?The Visitor guide is an innovative resource using the iPad platform to conveniently provide valuable information about entertainment, dining and events to all. The Oregonian and OregonLive.com will continue to work together to connect our communities and provide information in new and exciting ways,? said John Jackson, general manager, OregonLive.com. The app is available for download at no charge in the App Store. It was developed and launched with Advance Internet and Mobile IQ?s PressRun software to provide a uniquely compelling iPad experience for people interested in travel and tourism in the Pacific Northwest. Download the Best of the Northwest: Visitor guide to Portland and the Pacific Northwest for free from the App Store here. ?From restaurant reviews to remote campgrounds to family friendly activities, the app brings together the best of Portland and beyond in an easy-to-use format,? said Ben Sherman, editor-in-chief, OregonLive.com. OregonLive.com, a subsidiary of Advance Digital, is the leading local website for news and information throughout Oregon featuring the latest Portland news, business, sports, travel, weather, traffic, shopping and entertainment information. In addition, OregonLive.com has a comprehensive business listings directory, as well as local classified listings for jobs, homes, apartment rentals and autos. OregonLive.com is powered by The Oregonian and Hillsboro Argus. The Oregonian is the leading newspaper in Oregon, read by a majority of adults in the Portland area. The Pulitizer-prize winning paper delivers news and entertainment every day and has been telling the story of the Northwest for 160 years. Weekly features highlighting Northwest people, events and lifestyles include Community News, A&E, FOODday, Homes, Autos, and Homes & Gardens. Subscribe at oregonlive.com/oregoniansubscribe. Advance Digital, based in Jersey City, NJ, provides digital information and connection solutions for local consumers and businesses. The company operates 12 media properties across the U.S. that are the number one local news, information and community hubs in the markets they serve. The sites include al.com, cleveland.com, gulflive.com, MLive.com, NJ.com, NOLA.com, OregonLive.com, SILive.com, syracuse.com, MassLive.com, PennLive.com, and lehighvalleylive.com. Mobile IQ helps publishers and media agencies take their content mobile in intelligent, engaging, profitable ways. Its publishing hub enables content owners large and small to reach new audiences and make new revenue. Added with its ability to rapidly develop, integrated smartphone apps, Mobile IQ helps its customers stand out from the crowd. Please visit http://www.mobileiq.com or http://www.pressrun.com for more information. Discover Practical Biblical Secrets to Becoming Free From Debt…Achieving True Financial Freedom…And Walking In Gods Blessings From This Day Forward! James Klotzle is a Christian life coach, counselor and author helping many people with StressFreeFast.com” rel=”StressFreeFast.com”>stress. God In Our StressFreeFast.com” rel=”StressFreeFast.com”>Stress is a powerful Christian self-help book for effective StressFreeFast.com” rel=”StressFreeFast.com”>stress management, with internal navigation links & printer-friendly activity section. Homebrew3Wizard – Play Homebrew Games on your Ps3! Hot niche, great potential, enormous market! Homebrew3Wizard is product that will enable homebrew games to be played on a Ps3 Console. Play any backed up game on your hard disk. Learn How-to Start Your Own Business Importing from the Third World and The Money Will Follow! With 30+ years in the business importing from the Third World, I’ll teach you all you need to know to become successful in import export business. Tana Toraja is one of the beautiful region in South Sulawesi, let alone in Indonesia. From the distance, one can see the jagget ridges of the hill stretching side by side along the slop of the mountains. Moreover, one can be also find beautiful valleys in which bamboo and sugar palms are growing and the traditional houses with curved roof among the paddy field, beautiful and naturally carved and colored by the skillfull people of Toraja. Before the Ducth came to power in this highland in the 20 th century, there was not a single word given for the name of their religion except for the word “Aluk” means “the way” which refers to rituals and daily life activities that are to be controlled; like how to build a house, to cook rice, to greet children and the head of the vilage, and the number of buffaloes and pigs that must be slaughtered in every ritual ceremony. The most prestigious ceremony in Tana Toraja is the Death Ceremony. More than half of the people of Toraja are Christians, but they are proud og their Cultural heritage and uphold it. This can be seen when they welcome the guests ritually. The Torajan people had little notion of themselves as a distinct ethnic group before the 20th century. Before Dutch colonization and Christianization, Torajans, who lived in highland areas, identified with their villages and did not share a broad sense of identity. Although complexes of rituals created linkages between highland villages, there were variations in dialects, differences in social hierarchies, and an array of ritual practices in the Sulawesi highland region. “Toraja” (from the coastal languages’ to, meaning people; and riaja, uplands) was first used as a lowlander expression for highlanders. As a result, “Toraja” initially had more currency with outsiders such as the Bugis and Makassarese, who constitute a majority of the lowland of Sulawesi than with insiders. The Dutch missionaries’ presence in the highlands gave rise to the Toraja ethnic consciousness in the Sa’dan Toraja region, and this shared identity grew with the rise of tourism in the Tana Toraja Regency. Since then, South Sulawesi has four main ethnic groups the Bugis (the majority, including shipbuilders and seafarers), the Makassarese (lowland traders and seafarers), the Mandarese (traders and fishermen), and the Toraja (highland rice cultivators). The graveyard lies on one of the hillsides. It is carved as the resting place of the kings and king’s family; in conform to the Toraja King dresses, placed in front of stone grave. There are some stone steps to reach the hill, where the kings had their contemplation during their life. A museum will be built in this place to keep the property of King Sangalla. In Lemo graveyard you can see the several “Tau-tau” together adjoining the steep rocky museum on the open air, a combinations between death, arts and ritual. “Tau-tau” is a small wooden statue which sometimes is made of bamboo tree. The clothings are altered periodically in a ceremony called Manene. This statue is considered as a home of the spirit of the death person. Londa is teep rocky side grave. One of its side is located on a higher place from the hill with deep caves where coffins are arranged and grouped based on the family lines. On the other side of the hill, on the balcony, dozens of “Tau-tau” stand up high, as if they were alive, eyes open, looking over the green landscape. Kete’kesu is a village which is still traditional in character. If you take a look from the front side, you will find it lying in the middle of the wide paddy fields, it beautiful sequences of curved roofs and carved barn walls. This village consists of four traditional Tongkonan House of Toraja, rice barns, and megalith stones set among the rice fields. Inside one of the Tongkonans, some kind of a small museum is located in the middle of the ground floor. Most of the people of this village have a good mastery in carving and painting. This can be seen among them who are doing carving and painting. Ke’te’ kesu is located about 4 km to the southeast of Rantepao in the district of kesu’. There is also a aristocratic burial site on cliffs with hanging graves and effigies ( ‘ tau-tau ‘) located about a hundred meters at the rear of this village. By tracing to the north along the Sa’dan River, you will come to an area named Pallawa. In this place, “Tau-tau” and Tongkonan House welcome the tourists coming to the place. Tongkonan Pallawa is one of the interesting Tongkonans, which is located among the leafy bamboo tree on top of the hill. It is decorated with a number of Buffalo’s horns attached to the front of their traditional house. The cold Batutumonga is located in Sesean area. It has an altitude of about 1300 m. In this area you can find about 56 Menhir stones in one circle with five trees in the middle. Most of the Menhir stones are of 2 – 3 m high. The most beautiful view of Rantepao and its surrounding valley can be seen from this spot. The beauty of the landscape make this area very interesting to visit. Located 27 km from Rantepao at the district of South Sangalla. There is a hot spring water resouces in this place and you can also find a house for taking s rest. It’s nice to have a bath in this warm water after a long trip. Marante is a village where a lot of Tongkonan House, big paddy barns and big rocky hill containing hanging stone graves which the located called “Erong” can be found. Tumakke is a small village at the district of Rembon, about 10 km to the west of Makale. On this village you can see a distinguished traditional house. The house has roofs made of stones, called “papa batu”. It is 6 km from Rantepao a road to Sa’dang and Pallawa. The most intresting object in Bori is the tall ‘rante’, menhir stones, soared up several meters above the land. Some people believe that To’barana Sa’dan is the centre of Toraja area. At certain parts of these villages there are four rice-barns that are very well kept with a neat grass yard. Very interesting Toraja weavings are displayed and sold in this village. Around the village, terraces of rice fields are also beautiful to look at. Bolu is a unique Toraja’s traditional public market. It is located about 1 km from the center of Rantepao town. Every six days, on the big market day, many buffalos and pigs are available for sale to those who need especially for funeral or thanksgiving ceremonies. Torajanese held traditional ceremony called Rambu Solo. Rambu Solo is customary ritual death Tana Toraja society that aims to respect the spirit and the people who deliver death to the spirit, which is returned to the immortality with their ancestors in a health resort, called Puyo, which is located in the south where people live. The ceremony is often also called the completion ceremony of death. Therefore, local people consider this very important ceremony, because perfection ceremony will determine the position of this spirit is the person who died, the soul reaches the level of the gods (to-membali puang), or become a patron deity (deata). In this context, the ritual signs Solo into a “duty”. In the beliefs of Aluk, soul of someone who died must be delivered so that he can reach heaven (puyo). Rambu Solo is a delivery. If family did not carry Rambu Solo, soul of the deceased will be rumble. So with all the power efforts, a certain kinship will conduct this ceremony. If kinship do not have cost to implement them soon after death, they may collect money first. 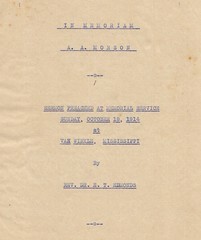 But before the ceremony was conducted, the dead must be considered only as a sick or weak men. Remains stored in the house, still given food and drink, even ask the dead to talk as always.